7. Package Details: Individual packing in heat-treated wooden crate or as per custom request. 12. Custom designs are available Features: - Each item is unique in natural stone color and vein lines - Combine simplify & high-class - Durable - Easy to maintain Each bathtub is carved from a single block of natural stone by our workers with chisels and hammers. 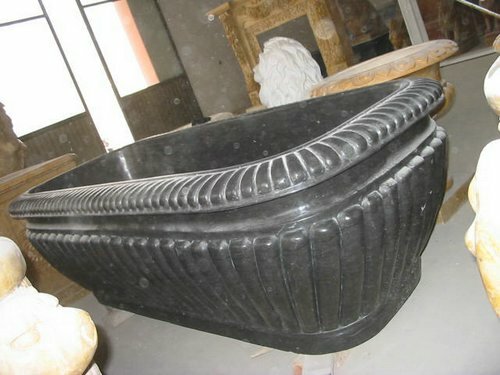 The tub has natural variations in the stone and is considered an individual work of art. If any question or want to know about our products, pls fell free to contact us. The more you order, the lower the unit price you will get. If you buy a big quantity, the low factory price will surely surprise you. Note: 1. We have stone Marble bathtub, granite Marble bathtub, stone sink, stone bathroom accessories, stone tile, stone Mosaics, stone faucet, stone vanity top and so on. All of them are made of beautiful natural stone.